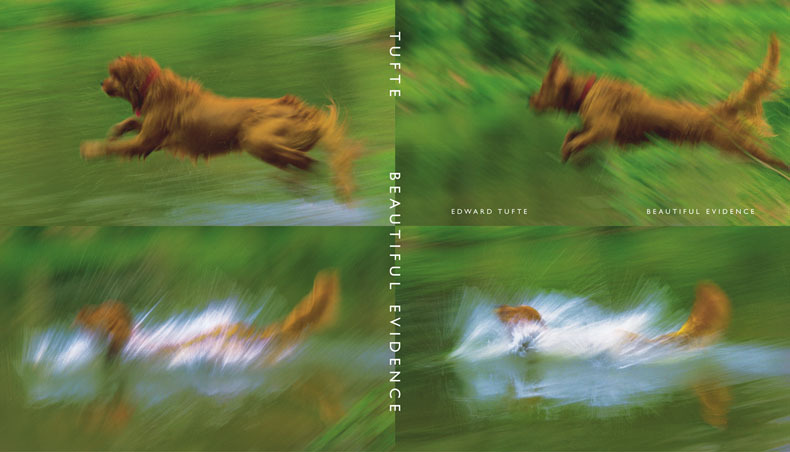 I read Tufte’s early works many years ago, but I had not seen any of his more recent work and so I bought a hard copy of Beautiful Evidence (2006) this past month. He is a man who talks about design and it shows in the fabrication of his book which is a physical pleasure to pick up with its high quality paper, selection and fonts, and wonderful images from a variety of disciplines. The book can be picked up by a beginner to the subject of visualization. It starts slowly talking about how information is mapped into the visual space. It’s interesting, though a bit on the esoteric side. For example, he shows diagrams from the 18th century on how to perform a dance. While intricate and clever in their notation, I find such materials to be completely antiquated. A properly edited video showing closeups of real people combines melody, rhythm, and dance moves in ways that printed diagrams cannot come close to replicating regardless of their sophistication. Clearly, for some forms of communication, the printed word or picture is not the best medium. However, when he moves into the discussion of word-sized graphics which he calls sparklines (a term he invented), his discussion is both persuasive and compelling. Graphics don’t need to be half pages with 99.9% white space. They can be the height of type and 7-10 characters long and convey a massive amount of information. Likewise, when he moves to analysis of Feynman diagrams, he shows that small, colorful, symbolic, and notated graphics compact a great deal of information. Think of electronics diagrams. His section on principles of analytical design is equally illuminating. He uses a 19th century diagram of Napoleon’s troop movements to illustrate a number of principles. I think this is particularly brilliant because we tend to assume that we are smarter than people 150 years ago instead of just knowing more. An insightful design 150 years ago still shines upon brilliant analysis. I’m not sure that I really understood the importance of including the last section on sculptural pedestals. It struck me as more of the author’s personal interest than really adding to the content of the book he was writing, and I would have preferred more reading on some of the other subjects. But this is minor, and does not diminish the insights or obvious effort that he spent creating the work.